Nairobi (HAN) March 26, 2014 – By: Magnus Taylor: I took a couple of hours out today to visit what used to be called the ‘Gadaffi Mosque’ in ‘Old Kampala’. This, according to the testimony of my tour guide, is the oldest part of the city, and the hill on which the mosque sits was where the British first set up camp. The story goes that this was a place where many Impala were then found, so the settlement was naturally named ‘Camp Impala’, which over the years became Campala, and then to translate it into Luganda (the language of the local Baganda people) the C was replaced with a K and ‘Kampala’ was born. On the hill now stands the biggest mosque in the country, the initial idea for which came about in the early 1970s under the regime of Idi Amin, but was then abandoned for over 30 years with scarcely more than the foundations having been built. This was until Colonel Muammar Gaddafi visited the city in 2002 and offered to pay for the construction of a new mosque on the site. 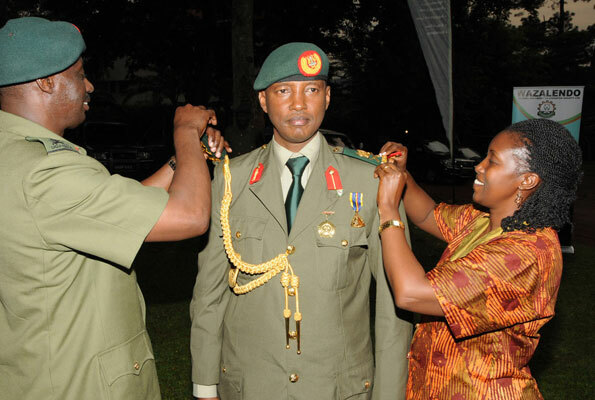 The Brother Leader’s visit coincided with the period in which he sets his sights on becoming the head of a loosely affiliated African empire and much largesse was bestowed upon African friends, Yoweri Museveni – whose position at the top of the Ugandan tree is reaching Gaddafi-like lengths – being one of them. Gaddafi last visited Kampala as recently as 2010 for the AU summit held in the city that year. How times have changed. Gaddafi was killed fleeing Tripoli in 2011 and during the summer of 2013 the mosque was renamed by the Uganda Muslim Supreme Council to become simply the ‘National Mosque’. This was, I am told, after a request from the newly installed Libyan GNC, which asked that the name be changed as a precondition of further support for the maintenance of what is, in the best traditions of modern Middle Eastern architecture, a lavish and greatly gilded building. The promised funds have, however, not been forthcoming, complained my guide, pointing to a not-particularly-bad pothole in the adjacent car park. The future of the mosque, however, doesn’t look too uncertain. The building doesn’t seem to have deteriorated at all in the last 2 years and is almost exactly the same as when I was there last in 2009. The only obvious difference, apart from the name on the sign, is the disappearance of a mosaic of the Brother Leader on one of the walls of the mosque’s cavernous upper chamber. When I asked about this, the guide – seemingly getting irritated by my line of questioning – snapped that they “got rid of this straight away, obviously”. Changing the subject quickly, he began to describe why men and women pray separately in the mosque, using the unfortunate example of the quiet middle aged German couple’s teenage daughter: “If she were to pray with the men then what a distraction it would be!” We declined to comment and the girl’s face, framed by the head scarf she and her mother had been instructed to put on at the commencement of the tour, went a deep red. From the top of the mosque’s minaret you get a wide panoramic view of the city. It struck me that Kampala is experiencing a semi-Nairobification, with shiny high-rise office buildings springing up in small clusters and the inevitable mall construction happening apace. And just like Nairobi, Kampala is a possible target for another attack by the Somali islamist group, Al Shabaab. Uganda has had a much more long-standing (and significant) military presence in Somalia than Kenya, which has recently become more internationally associated with the intervention following the traumatic events at the Westgate shopping mall at the end of last year. But we shouldn’t forget that Uganda was the first East African country, other than Somalia itself, to experience a terrorist outrage in its capital, when a bar where people were gathered to watch the World Cup Final in July 2010 was bombed, claiming more than 70 lives. The US Embassy released a warning recently (picked up by international media) that several high-profile buildings in Kampala, including the rather unlikely National Museum, were thought to be potential targets. This happened on the same week that a new mall was opened a few hundred yards away from the British High Commission and, so a friend told me, could probably explain the poor performance of the shopping centre over its first few days. But despite the lingering feeling that Kampala may be due, the terraced cafes and restaurants are full with the normal ex-pat crowd and middle class Ugandans. Most upmarket places have free wifi and the majority of people in any such establishment have their phones, tablets or laptops within easy reach. If the advent of mobiles phones may be the catch all cliché for Africa’s economic growth over the past decade, then I think a newer and associated innovation is becoming just as important. This is mobile internet – the ability to buy cheap mobile data pay-as-you-go for a Smartphone. For me, this has been the biggest change to the way I have operated as a writer, researcher, journalist or tourist since I first came to East Africa 5 years ago. Back then I wouldn’t have considered using Google Maps on my phone to navigate myself round even the biggest cities. This time I was able to access my email and tweet out updates on my coach journey from Nairobi to Kisumu. If I can achieve such a relatively unimportant task as social media status updates, think what it can (and probably does already) do for those who run businesses. Whilst the cities of East Africa grow increasingly similar in appearance, Kampala still retains much of its chaotic charm. And I still can’t resist the lure of a mad motorcycle taxi ride through the backstreets to my hotel or next meeting – I arrive feeling invigorated and grinning. This is despite the advice of my boss, a far more experienced Kampala visitor than I will ever be, to “stay off the bodas”. I’m sorry Richard.